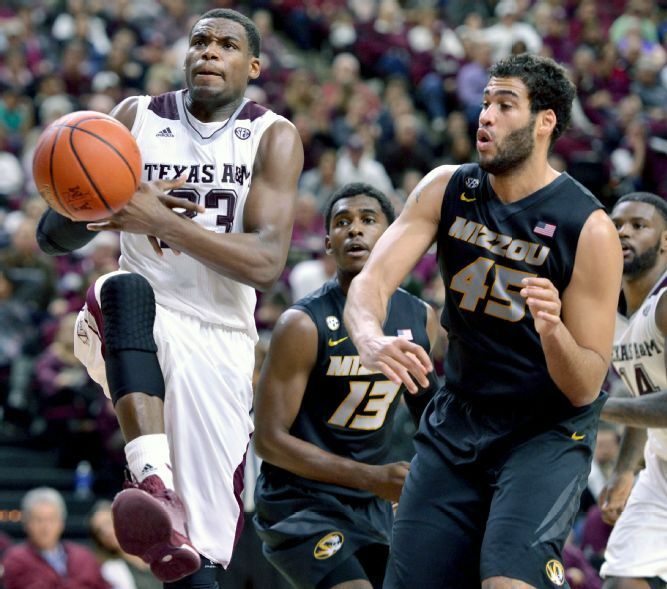 A career high 18-point performance from Wes Clark wasn’t enough to give the Missouri Tigers an edge as they dropped their fourth straight conference matchup to the Texas A&M Aggies 62-50. The Tigers came out of the gate with momentum going 4-6 from the field giving them an early edge 9-4. The Aggies quickly responded by capitalizing on Missouri fouls and turnovers to take the lead midway the through the opening half. Despite shooting just 33 percent from the field in the first half the Aggies outrebounded the Tigers 20-12 to keep Texas A&M in the game. Backed by 12 first half points from Clark Missouri held a 31-24 advantage at the half. The Aggies went on a tear to open the second frame connecting on their first five shots of the half to regain the lead 42-36. Jalen Jones and Danuel House provided Texas A&M with the majority of its offense as each added 16 points. Missouri fell further behind throughout the second half as it was only able to muster up a mediocre 19 points en route to the loss. This was the second straight game only one Tiger finished in double digits in the scoring department. The loss is also the third straight road loss for the Tigers, as they seem unable to find a way to execute on either end of the floor. They were unable to match up down low with Jones and House, which allowed the Aggies to force the ball low and generate points in the paint. The story continues to be the same as Missouri continues to struggle against conference opponents. The Tigers can’t compete with the size of the bigger SEC teams and still have yet to put together a solid 40-minute shooting performance. With it looking like a lost season it is comforting to see the players give it their all game in and game out despite what the scoreboard says. These young guys are going to get better and improve their craft over the course of this year into next. Coupled with the addition of some new players in the coming years Kim Anderson and his staff will turn this team around. Up next on the Tigers schedule is conference rival Arkansas, who come to town on Saturday. For more Missouri Tiger updates follow @NickYahl on Twitter.